North Korean leader Kim Jong-un’s latest trip to China, the fourth of its kind, is likely a move designed for Kim to reach an accord with Pyongyang’s closest ally before holding the second US-North Korea summit. 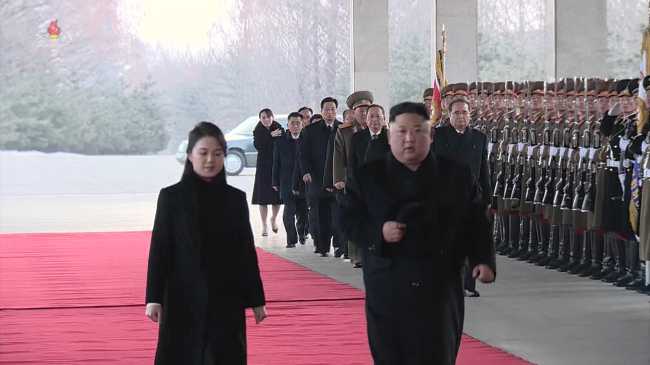 As North Korea has largely been relying on its bigger neighbor for economic and diplomatic support, experts say Monday’s trip is also viewed as a strategy for Pyongyang to raise its negotiating power in talks with the United States. While the North Korean leader’s itinerary usually comes as a surprise, the North’s Korean Central News Agency made a rare report confirming Kim’s visit prior to his arrival in Beijing early Tuesday. China’s Xinhua News Agency also confirmed Kim’s visit. According to the two news outlets, Kim departed on Monday night for the four-day trip at the invitation of the Chinese president. Kim is spending more time in the neighboring country than his two previous trips in May and June 2018, which lasted for two days each. His first visit was a four-day affair. The latest trip also coincided with Kim’s birthday that fell on Tuesday, leading to speculation on whether China has made plans to celebrate the event. Seoul welcomed Kim’s trip to Beijing and expressed hope that talks between the two countries would positively influence denuclearization talks. “We hope the exchange between China and North Korea will contribute to the complete denuclearization of the Korean Peninsula and the establishment of lasting peace,” Cheong Wa Dae spokesman Kim Eui-kyeom said in a press briefing. The spokesman also confirmed that the presidential office had been informed in advance of the meeting. The North Korean leader’s first official trip to China was in March 2018, ahead of the first Moon Jae-in-Kim summit in April and Trump-Kim summit in June. Kim’s first overseas trip since he came to power in 2011 was seen as Pyongyang’s attempt to demonstrate its close ties with China and ease possible concerns that its ally might be sidelined in discussions that would soon start among the US and the two Koreas. Kim’s next two trips to China came closely before and after the June 12 US-North Korea summit. “On the basis of the precedent, Kim’s summit with Xi appears to signal that North Korea’s summit with the US is imminent,” said Ko Myung-hyun, a researcher at the Asan Institute for Policy Studies. “But considering the partial shutdown and ongoing domestic affairs in the US, it may not be easy to hold a summit soon. So Kim’s visit appears to be a little early, but it may well have been planned in advance,” Ko added. Ko explained that Kim’s move is aimed at diplomatically pressuring Washington. Another expert sees the meeting between Kim and Xi as a proactive step taken by North Korea for sanctions relief. “Under mounting pressure from sanctions, North Korea should make a decision whether to reconcile with the US or take a new path with China,” said Ahn Chan-il, a former North Korean military officer and president of the World Institute for North Korea Studies. North Korean leader Kim said in his New Year’s speech that the communist country will actively promote “multi-party negotiations” to replace the current cease-fire on the Korean Peninsula and that it will find a “new way” to defend its interests. These remarks have been fueling speculation that China will step up its presence in its ally’s diplomatic relations with other countries. However, being too close to North Korea may be a double-edged sword for China, as it may have to take responsibility for North Korea’s actions. But China would still be able to show its power over the Korean Peninsula, Ko said. Amid escalating tension between China and US on trade, Beijing is taking a risk in holding the summit with Kim, Park Won-gon, a professor at Handong Global University, told The Korea Herald. “Concerning the denuclearization of the Korean Peninsula, China has been showing a more cooperative attitude toward the US. So, unlike the past three summits, China may advise the North to take stronger actions for denuclearization,” Park explained. In addition to discussing the second North Korea-US summit, Kim may seek to strengthen cooperation with China by discussing a broad range of other issues, including economic issues and inter-Korean relations, said Kim Dong-yup, a professor at Kyungnam University’s Far East Institute. “I think Kim will bring some ideas and a road map for his nation for 2019 or maybe even 2020 and beyond,” he said.